When you enter the D Concourse tram station of the new $2.4 billion Terminal 3 at McCarran International Airport in Las Vegas, Nevada, you will see stunning photomosaics of children's art by artist Robert Silvers that show planes, trains, hot air balloons, and other modes of transportation. But there's another way to see the jigsaw-like pieces of student art up close. 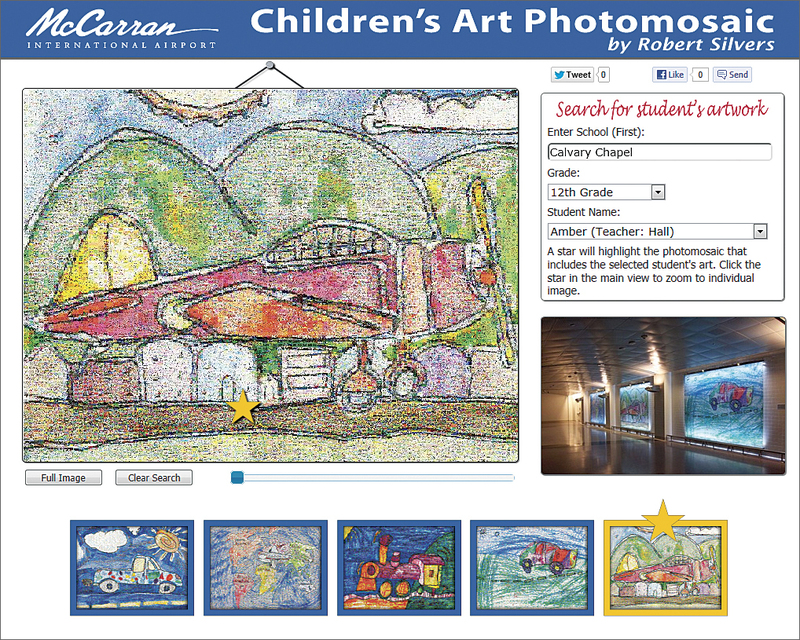 Senior GIS programmer Don Kang from the Clark County Department of Aviation and his team created the Children's Art Photomosaic website, which lets you view the art from anywhere in the world. With a little help from ArcGIS, Kang and his team also built an application for the site that uses an image service created in ArcGIS for Server to zoom in closely to better see the smaller pieces of student art within Silvers' 10 photomosaics. 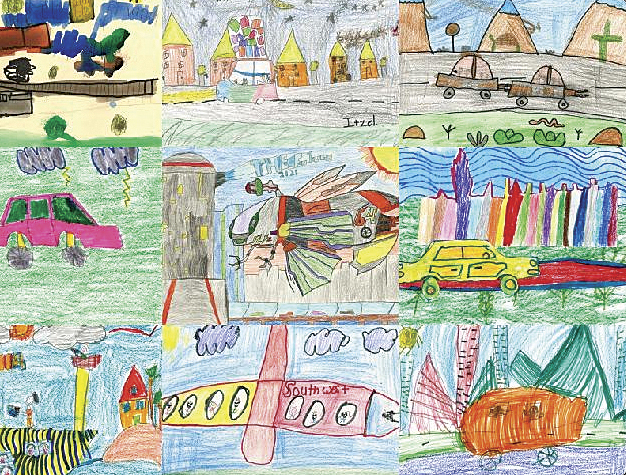 Click a bright red biplane, zoom in, and you will see individual crayon and pencil drawings of hovering helicopters, chugging trains, and roaring rockets. 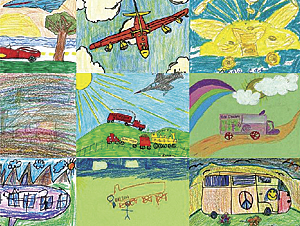 Tap on any of the images, and a pop-up window appears with the student artist's name and grade, the teacher's name, and their school. The art project began in 2008 when the Clark County Department of Aviation, which manages McCarran International Airport, partnered with the local school district and invited students to submit artwork depicting planes, trains, automobiles, and vehicles for an art installation at the D Concourse tram station. The station serves as gateway to the state-of-the-art Terminal 3, which opened last summer. 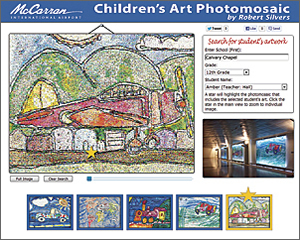 The application uses GIS to let visitors to the Children's Art Photomosaic website locate individual works of art created by children that compose the photomosaics. Nearly 33,000 unique pieces of art were submitted by students from all grade levels, kindergarten through high school, and of those pieces, 10 student entries were selected to be re-created by Silvers, a renowned artist credited with inventing the photomosaic process while a student at the Massachusetts Institute of Technology. Silvers used all 33,000 student art pieces—some multiple times—to re-create the 10 winning works as photomosaic displays. 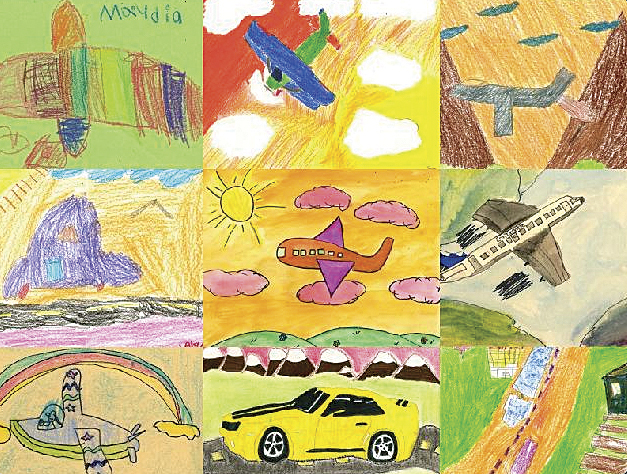 The Department of Aviation's website team created a site to display Silvers' work that let the viewer zoom in and out of the images in a photomosaic and see the smaller pieces of art that compose each one. The team also was asked to devise a way for web visitors to locate these smaller works of art using information about specific student artists. When considering how to solve this problem, Kang recalled a demonstration of a Microsoft Silverlight application at a Microsoft MIX conference. The presenter zoomed deep into an image while still maintaining clarity. Not having Silverlight in its arsenal, the team brainstormed ways to achieve similar outcomes with the tools available to them. Kang soon realized that image caching would be the perfect solution for the problem he faced. Since the photomosaic images were not georeferenced, the team applied a local spatial reference (i.e., one not associated with any map coordinate system) so Esri's ArcGIS for Server could process the cache. Silvers used all 33,000 student art entries to re-create the 10 winning works as photomosaic displays. Normalizing the attribute data for the photomosaics posed some challenges for Kang's colleague Kristy Graczyk, a senior engineering technician. 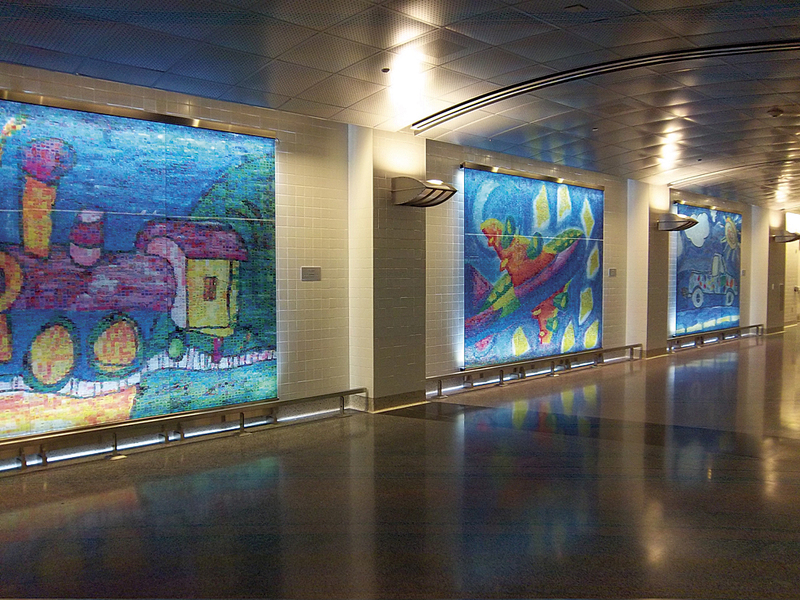 Each of the 10 mosaics are composed of approximately 10,000 images for a total of 100,000 images. Each image has attribute data—the student artist's name, school of origin, teacher, and grade level—that was entered in a spreadsheet. Graczyk manually reviewed the data, correcting spelling errors and identifying incomplete information. Once the spreadsheet was vetted, Graczyk designed the website, giving it a bright and uncluttered feel. To celebrate the project that was more than four years in the making, McCarran International Airport hosted a reception in October 2012 at the D Concourse tram station. Honored guests included Silvers and most of the 10 student artists whose works he re-created. This was the first time the student artists, their families, and their teachers viewed the photomosaic art installation. The evening also featured the launch of the Children's Art Photomosaic website. Using a computer set up at the event, guests had a great time searching the online photomosaics and locating the works of friends, children, and grandchildren. "I think we really enjoyed this process and are so proud of what we have created because at the onset, this wasn't considered a GIS project. But we ended up with an amazing final product by utilizing a GIS application in a new and unique way," said Kang. "I can't say for certain, but I think this could be the first-ever art website that uses GIS technologies."